July 15th, 2008: Sunny and Warm, Water temp 85* and Clear. Picked the guys up at the marina and set up on some breaking Stripers. Made a few casts at them and put a few in the boat but they sounded quickly and we were not able to work them for long. Started trolling in the area but had little success. Fish today were pretty broke up and not schooled very tightly. We hit numerous schools of Stripers, catching a few here and there, the fish just not eating today. 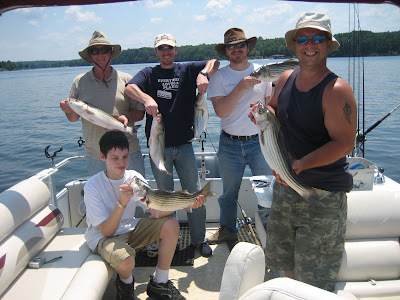 We caught 17 Stripers and worked hard for all of them. Did not matter too much to the crew, for many of them they caught the largest fish of their lives and had a great morning outing on the lake.